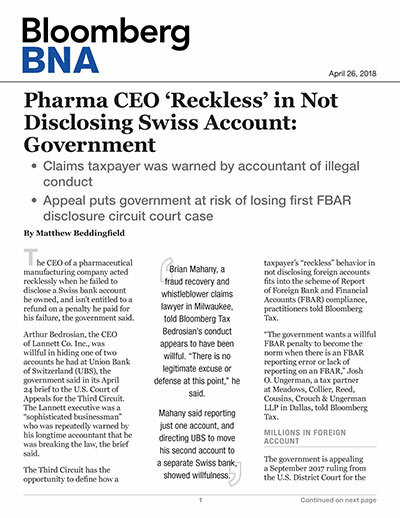 The CEO of a pharmaceutical manufacturing company acted recklessly when he failed to disclose a Swiss bank account he owned, and isn’t entitled to a refund on a penalty he paid for his failure, the government said. Arthur Bedrosian, the CEO of Lannett Co. Inc., was willful in hiding one of two accounts he had at Union Bank of Switzerland (UBS), the government said in its April 24 brief to the U.S. Court of Appeals for the Third Circuit. The Lannett executive was a “sophisticated businessman” who was repeatedly warned by his longtime accountant that he was breaking the law, the brief said. The Third Circuit has the opportunity to define how a taxpayer’s “reckless” behavior in not disclosing foreign accounts fits into the scheme of Report of Foreign Bank and Financial Accounts (FBAR) compliance, practitioners told Bloomberg Tax. “The government wants a willful FBAR penalty to become the norm when there is an FBAR reporting error or lack of reporting on an FBAR,” Josh O. Ungerman, a tax partner at Meadows, Collier, Reed, Cousins, Crouch & Ungerman LLP in Dallas, told Bloomberg Tax. The government is appealing a September 2017 ruling from the U.S. District Court for the Eastern District of Pennsylvania that Bedrosian was entitled to a refund of the FBAR penalty he paid for not disclosing a $2 million UBS account. The lower court found that the government didn’t meet its burden of proving that Bedrosian willfully omitted his $2 million UBS account from his 2007 FBAR, and said evidence pointed to the omission being an oversight or negligent act. Bedrosian’s failure to report the second account wasn’t willful because he checked the box indicating he had a foreign account on his 2007 tax return, identifid Switzerland as the country in which the account was located, and filed a FBAR for 2007 stating he had assets in a foreign account, the federal district court said. The government is arguing on appeal that the federal district court ruling was based “on a perceived lack of evidence that Bedrosian intended to evade tax.” The lower court, therefore, imposed a higher standard of willfulness that went beyond the ordinary standard of knowing reckless conduct, the government said. Brian Mahany, a fraud recovery and whistleblower claims lawyer in Milwaukee, told Bloomberg Tax Bedrosian’s conduct appears to have been willful. “There is no legitimate excuse or defense at this point,” he said. Mahany said reporting just one account, and directing UBS to move his second account to a separate Swiss bank, showed willfulness. Fox Rothschild LLP in Philadelphia represents Bedrosian and declined to comment. The Department of Justice represents the government, and also declined to comment.